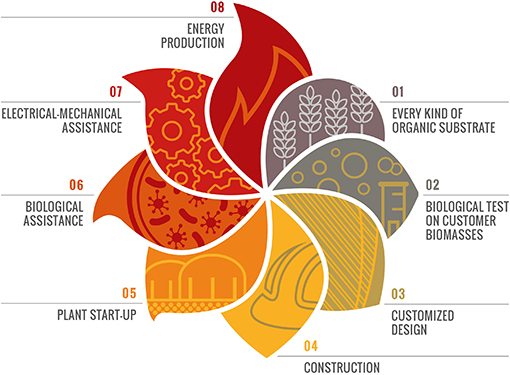 Since 2008 SEBIGAS designs, constructs and manages biogas plants world wide. Supported by over 100 years of industrial experience of the Maccaferri Industrial Group, SEBIGAS claims a solid expertise in the biogas sector, with a portfolio of over 80 biogas plants located all over the world, with units from 100 kW to 3 MW. SEBIGAS can offer tailored plants that satisfy the clients’ needs, exploit the potential of the substrate and guarantee optimal and long lasting performances. SEBIGAS portfolio today boasts a track record of over 8700 hours/year of operation at the maximum power. Since 2013 SEBIGAS is present also in Thailand with SEBIGAS UAC, a joint venture with UAC Global Public Company for the construction of a cluster of biogas plants fed with local substrates as tapioca pulp, napier grass and other energy crops typically used by the local industrial and agricultural sector. From 2014 SEBIGAS is also present in Brasil with the local brand SEBIGAS do Brasil, operating as EPC contractor and technology provider. SEBIGASdoBrasil offers specifically designed biogas plants fed with local industrial and agricultural by-products, as cassava, pome etc etc, for the production of biogas or biomethane. Since 2018 SEBIGAS can count also on important partnerships in the United Staes and Argentina, guaranteeing a local presence, always ready and experienced, to satisfy our clients requests. Moreover, thanks to a continuous support with our headquarters in Italy and the Maccaferri Industrial Group, SEBIGAS operates also in other countries as Turkey, France, Belgium, UK, Ireland, Indonesia, Malaysia, Cambodia and other countries of far east and North America.